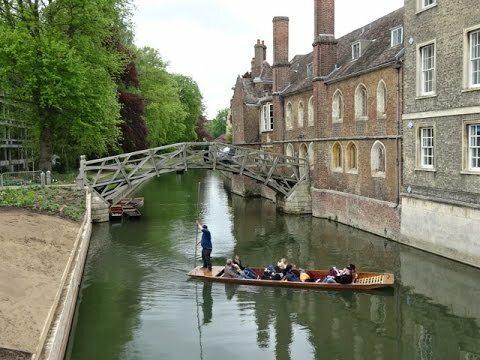 The River Cam is the river that runs through the university city of Cambridge. As the river passes by many of the city’s colleges, students have little choice than to be aware of its existence but many of the students grow affection for the river and what it can offer them. Some students, of course, take up rowing and hope to earn a place in Cambridge’s race team for the now famous and popular University Boat Race which takes place annually on the River Thames in London. This race takes place between the colleges of Oxford and the Colleges of Cambridge with a year’s bragging rights as the prize. The river can also become a source of extra income for some of the students as they can apply to become part-time guides on the punting tours. Cambridge punt tours are becoming increasingly popular with people coming from all around the country, especially to relax and enjoy the tranquility a punt ride can afford them. Along the route that the punt tours take, a punt will pass under nine bridges, each of which has a story behind the reason for it being built, like the Magdalene Bridge which was originally built by the Romans in order to allow passage across the river for the tradesmen using the Roman Road which connected London with the north of the country. One bridge, the Kitchen Bridge was built much later, after the colleges had been built and were built out of necessity perhaps due to an under the sight of college planners. Built in the grounds of St. John’s College, the bridge was built to allow food which was prepared in the college’s kitchens, to reach the new dining court which was built in 1825, on the other side of the river from the kitchens. This bridge, carved from a single piece of stone is said to have been designed by Sir Christopher Wren. The Bridge of Sighs in Venice is perhaps one of the most famous bridges in the world and certainly more famous than the Bridge of Sighs in Cambridge and bears no resemblance to it but none the less, the Cambridge Bridge of Sighs does exist and is one of the bridges tourists will learn about on a punt tour. Often people that have not been punting, think that it is the same as a gondola ride in Venice and although it may be in terms of being a relaxing experience and that the two both use poles to move along the waters, there are many differences between the actual punt and a gondola. A punt is oblong with square corners whilst the gondola is shaped like a large canoe with points at its front and back. Also, unlike a gondola, a punt has a flat bottom. It was the punt’s flat bottom which made it popular as a working vessel in helping fishermen on the River Thames in London, to bring their catch ashore over the shallow waters.